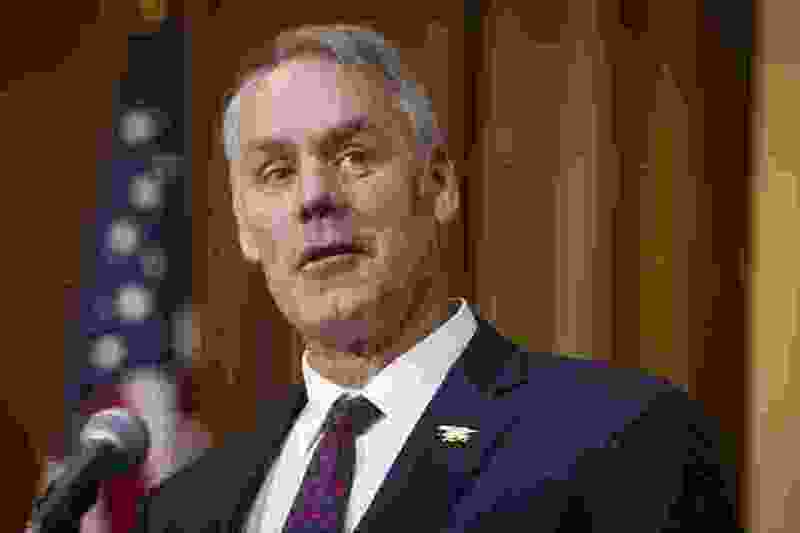 Washington • The Justice Department’s public integrity section is examining whether newly departed Interior Secretary Ryan Zinke lied to his agency’s inspector general investigators, according to three people familiar with the matter, a potential criminal violation that would exacerbate Zinke’s legal woes. The department's public integrity section has since been exploring the case, the people familiar with the matter said, speaking on the condition of anonymity to discuss an ongoing investigation. The extent of its work is unclear, though the inspector general had questioned witnesses in an apparent attempt to scrutinize Zinke's account, one of the people said. A spokesman for Zinke said Zinke voluntarily participated in two inspector general interviews about the Connecticut tribal matter and "to the best of his knowledge answered all questions truthfully." The spokesman said Zinke had not been contacted by the Justice Department and that disclosures about the matter violated inspector general and Justice Department protocols. On Wednesday, Zinke wrote a farewell letter to staff and posted a handwritten note on Twitter, but neither made mention of the ethics allegations that prompted his departure. "When I was a Boy Scout, I was taught to leave the campsite better than I found it," he wrote to Interior's 70,000 employees. "I am confident that over the last 2 years, we have done that together for our public lands and the Department of the Interior." The Justice Department's interest in the matter is significant, signaling prosecutors felt Zinke's account was suspect and warranted further scrutiny. Department officials have not yet decided, though, whether he should face charges, people familiar with the matter said. The crime of making false statements can be difficult to prove because it requires investigators to show a person "knowingly and willfully" lied, rather than simply misstated a fact. Zinke's resignation, too, could make him a less appealing target for prosecutors. Zinke, who submitted his resignation last month, had faced intense pressure to step down because of the probes into his conduct, though President Donald Trump had soured on him for other reasons, too, according to one of the people familiar with the matter. In particular, this person said, Trump was upset Zinke would not challenge Sen. Jon Tester, D-Mont., in last year's election and over how Zinke handled the administration's plan to expand offshore drilling. Last January, Zinke flew to Florida and, without consulting the White House, announced in a news conference with then-Gov. Rick Scott, R-Fla., that Interior would exempt the state from offshore drilling. The move raised ethics questions, along with an outcry from other governors whose coastal states were affected by the plan. It was not clear precisely what Zinke is thought to have lied about, but two of the people familiar with the matter said it was not about a land deal Zinke struck with the chairman of oil services giant Halliburton in his hometown of Whitefish, Mont. Interior's inspector general has been probing that as a possible conflict of interest. The inspector general has also been exploring Zinke's involvement in a dispute over a bid from two Native American tribes to operate a casino in East Windsor, Connecticut. The feud over the Mashantucket Pequot and Mohegan tribes' quest to jointly operate a gambling facility has sparked intense lobbying, since the outcome affects the flow of hundreds of millions in annual gaming revenue. The tribes allege Zinke succumbed to political pressure in not granting their application. Interior officials - including career staff and even some Trump appointees — had been poised to approve the agreement last summer, according to interviews with current and former employees and documents released under the Freedom of Information Act. Politico first reported career staff’s support for the tribes' petition. Ultimately, though, the department refused to sign off on the Mashantucket Pequot’s proposal, sparking a lawsuit from the tribe and the state of Connecticut. In September, U.S. District Judge Rudolph Contreras dismissed the tribe's initial claim. The Mohegan tribe withdrew from the litigation after Interior acknowledged the validity of its gaming agreement in June. But the tribe - which was nearly wiped out four centuries ago by the English — has continued to press its case. It sought to amend its claim in October, arguing in court documents that Interior staff had “prepared draft approval letters” on Oct. 8, 2017, but then informed the tribes a week later it would take no action on the petition, stymieing the project. The tribe charged that “the Department ultimately buckled under undue political pressure” from two Republican members of Congress from Nevada, Sen. Dean Heller and Rep. Mark Amodei. Heller, who has since left the Senate, having lost his reelection bid last year, could not be reached for comment. Amodei said in an October 2017 interview with newspaper columnist David Collins that he told Interior officials to "do their job" and was merely acting on behalf of a licensed gaming operator in Nevada. The court filing alleges "Senator Heller directly pressured Secretary Zinke to do what was necessary to stop the Tribes' joint venture casino project during a private dinner at a steakhouse in Las Vegas, on or about July 30, 2017." Zinke's official calendar shows he was in Las Vegas that day, before catching a late-night flight back to Washington, but it does not list his activities there.